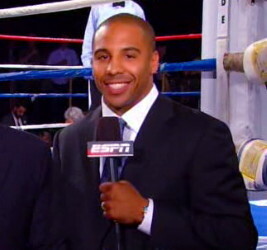 By Scott Gilfoid: WBA super middleweight champion Andre Ward (24-0, 13 KO’s) carried himself like a seasoned analyst last night in working the Demetrius Andrade vs. Grady Brewer fight on ESPN2’s Friday Night Fights as an analyst. If didn’t know it was the talented Ward, the best fighter in the super middleweight division, I could have sworn I was listening to someone with years of broadcasting schooling. Ward was amazing, flashing those pearly whites for the home viewers. He did a great job, and he looks in amazing shape for his October 29th Super Six tournament showdown against WBC super middleweight champion Carl Froch (28-1, 20 KO’s) at the Boardwalk Hall in Atlantic City, New Jersey. The Froch-Ward fight is considered to be the finals of the tourney, but it’s more like one of the preliminary fights because the real fights for Ward in the division comes later after he whips Froch like a bad habit. The real guys that Ward needs to worry about are IBF super middleweight champion Lucian Bute, Anthony Dirrell and Andre Dirrell. Those are the only guys in the division that can give Ward a fight. Sorry, Froch, but you’re too slow of foot and hand to compete with Ward. That much is going to be obvious by the 4th round when Ward slowly but surely makes Froch look like an ape in the ring. The television analysts will likely start tuning out and thinking past the fight already, talking about how Ward will do against guys like Andre Dirrell, Anthony Dirrell and Bute.